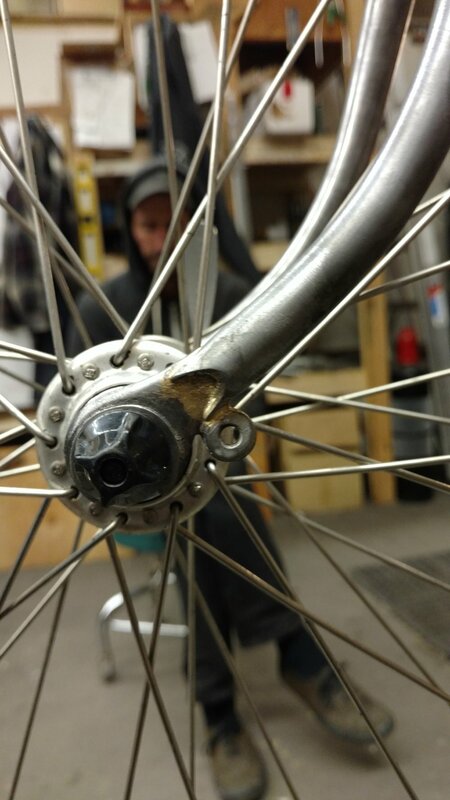 We make a lot of custom odds and ends too, for people looking to upgrade their existing bikes. Custom forks and racks top that list. Here are some examples of some of the cool projects we've done recently. 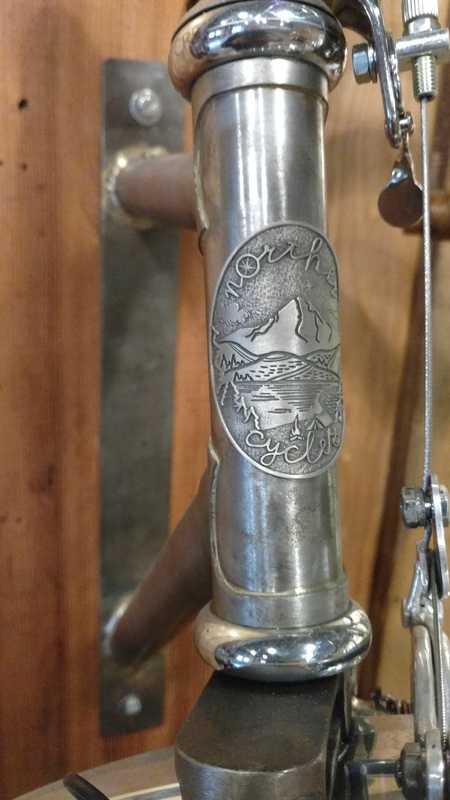 People have us make custom forks mostly because their existing fork crown is way to narrow, handles less optimally than desired, or there aren't the right braze on's, and most often some combination of the above. Our custom forks are made with a variety of fork crowns and blades. Our forks come in raw steel and fully ready for paint/powder or to install raw (forks left raw voids all warranties). We use our special custom made for us fork blade raking tool to give them that special french flip. 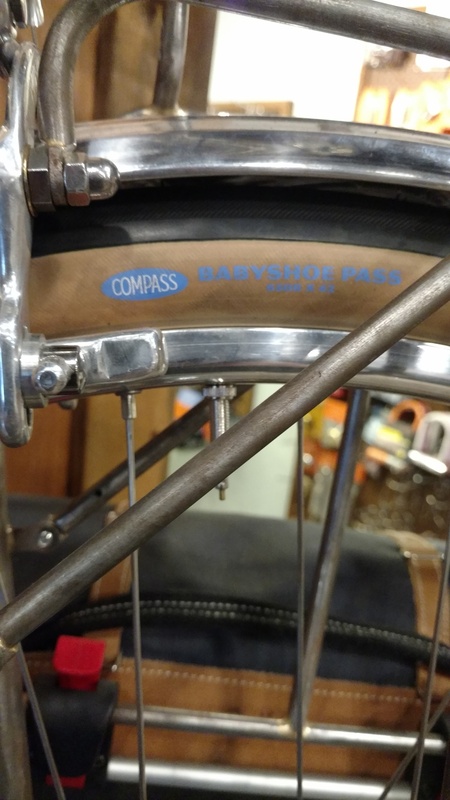 We typically use Columbus special long taper blades for randonneur forks, but other blade options may be recommended based on your needs. Our most popular option is to build your new fork for Son Connector-less SL. (this requires a special hub and fork). Fork pricing can be found in our Custom Work Pricing page. We make custom racks. They're not inexpensive, but they sure solve a lot of problems with stock racks. Such as actually fitting the bike, fitting well, and having all the features one want's with none of the features, (weight), you don't. They are incredibly light weight and strong as they they are made out of the highest quality thin wall aircraft grade 4130 steel tubing, instead of inexpensive thick heavy stainless or alloy with lots of extra hardware to try and make them a one size fits some monstrosity like most off the shelf racks. 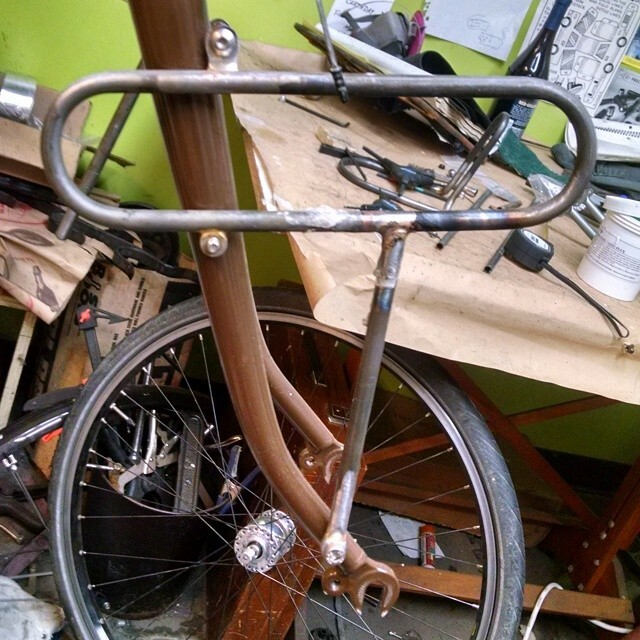 Custom racks are always recommended for our hand made bike for elegance and style. I personalty think stock racks look very out of place and are distracting on handmade bikes. 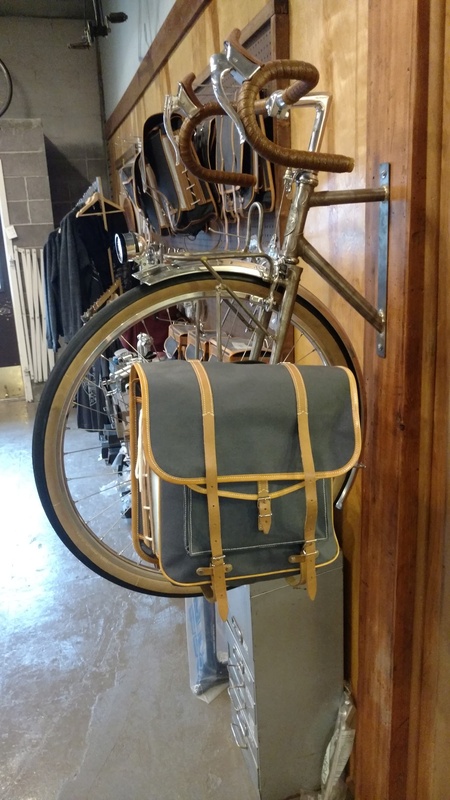 But, our hand made racks are not just for handmade bikes, they're for any bike that the owner want's to add some function and style too! Rack pricing can be found in our Custom Work Pricing page. 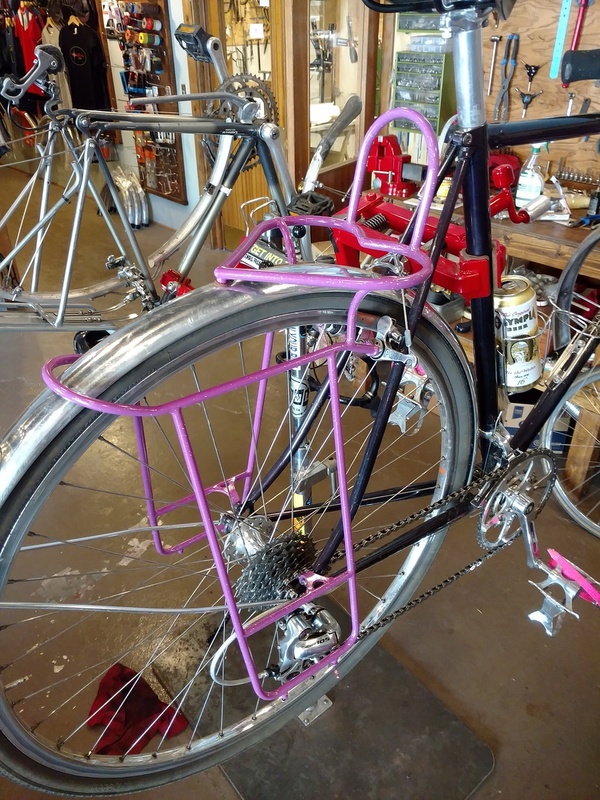 Rene Herse / Jan Heine's Mule Inspired Rack. 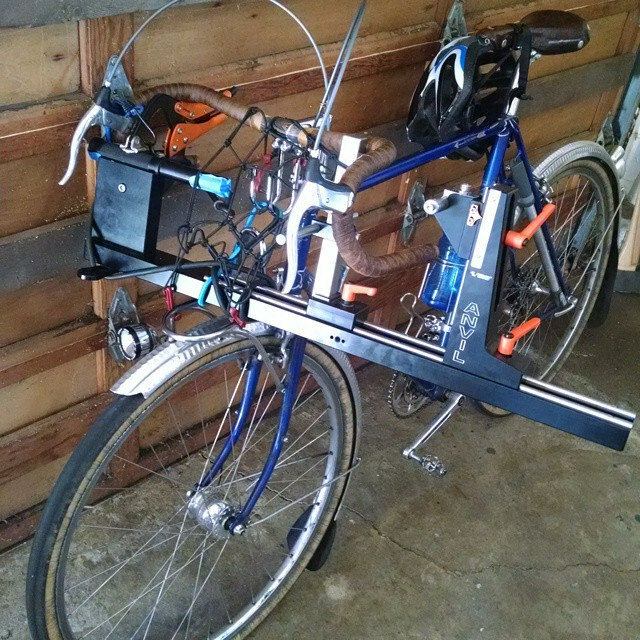 The second I saw Jan's "Mule" in Bicycle Quarterly I knew that was the rack everyone would want. Wouldn't you know it the next three racks ordered people said the same thing, "I want one just like on Jan's Mule." Well, fine, we'll make that. This is our first rack of this style. It consist of four pieces. 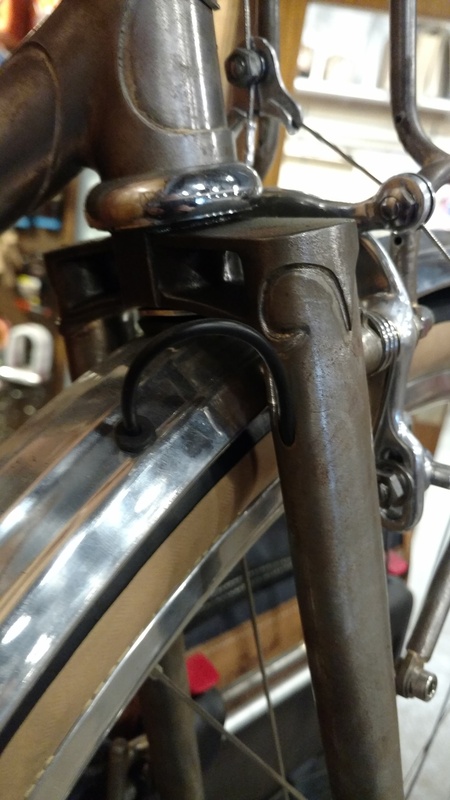 The first is the handlebar bag rack, but this is almost a separate piece as it doesn't attach to the detachable low riders. Really any handlebar bag rack, or none at all would work just fine with this detachable low rider set up. The other three parts consist of of the actual low riders, and the loop bar that loops up and connects it all together. If you look closely every aspect of our racks is made to to work well with the bags, every bolt is hidden away where it won't rub on the bags making hot spot holes. This rack can be pulled off the bike with one hex wrench for those rides that don't need extra luggage capacity and pack flat for travel. 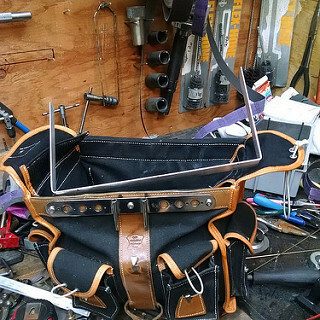 handle bar bag rack with detachable lowriders and CUSTOM headset stack decaleur. 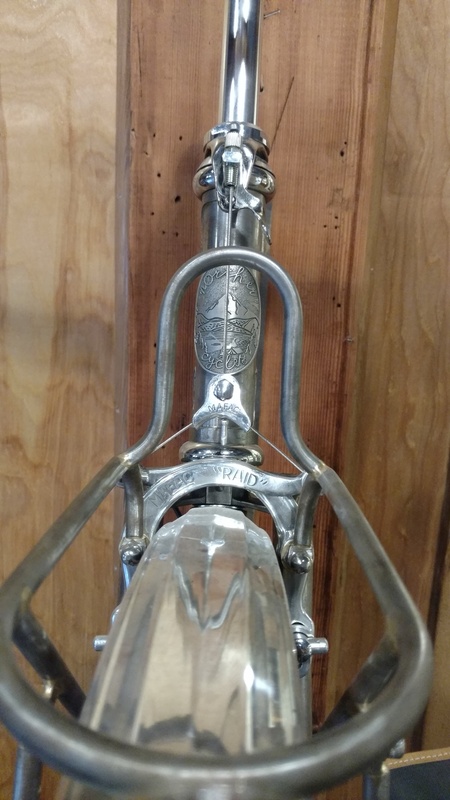 This set up was made for a Rivendell turned randonneur. It's a good example of what we like to do with the custom racks and detachable lowriders. Note the decaleur. I make every one different! 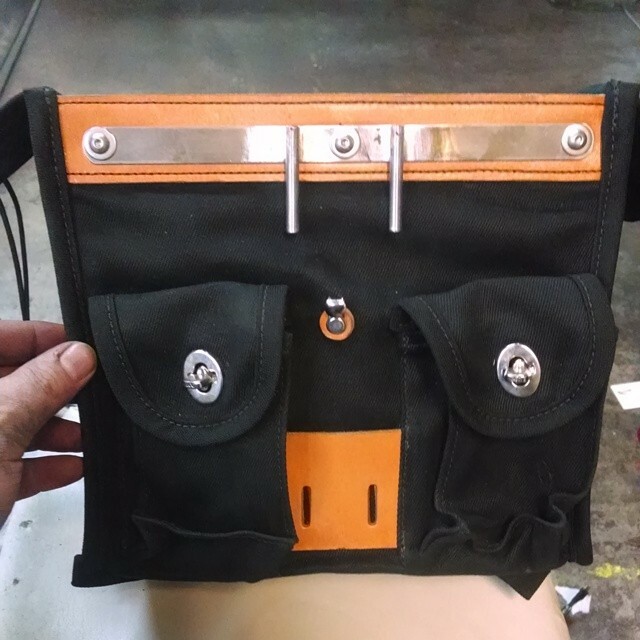 This one mounts to a headset spacer and drops down to meet the bag, it also has and integreated cable stop! We got to do this fun little rack recently for a very cool bike. 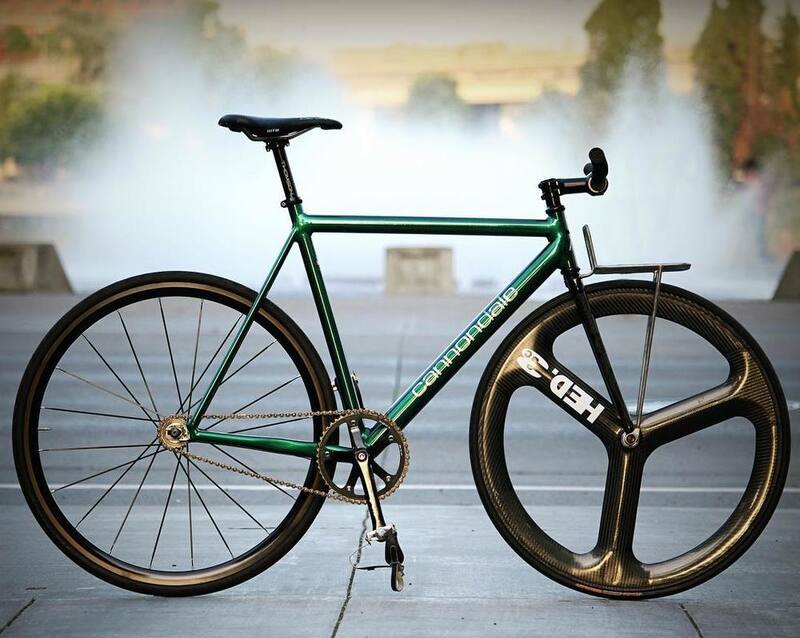 The bike is a track bike with no eyelets for a rack. 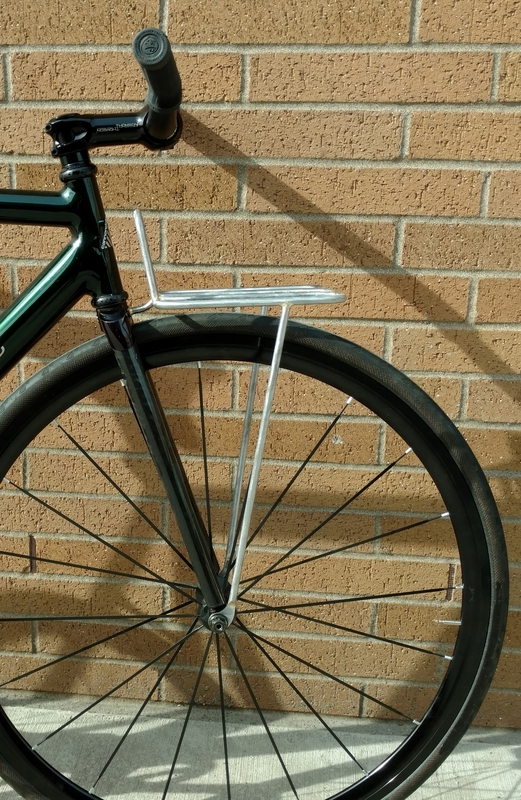 Luckily the fork crown had a hole in it so we could mount the rack there, and Frame Builder Supply is now making rack ends for track nuts, or quick release skewers, so we had a way to mount the lower stays. Straight up stole some sweet picks of of this rack off A. Danger's Instagram page. 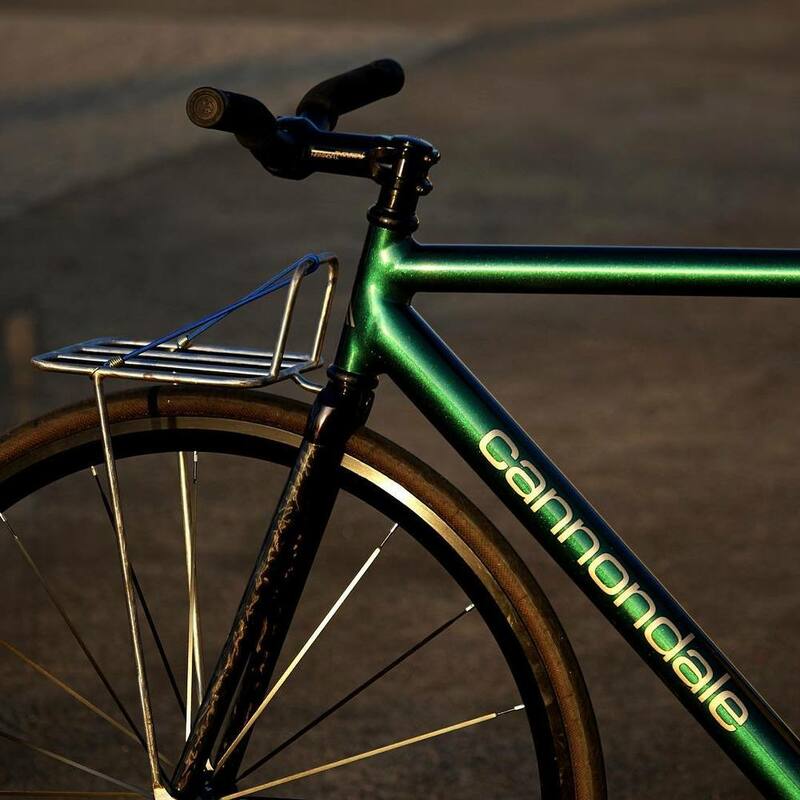 She's having way to much fun with it on her amazing Cannondale track bike not to share! Some times you just have to have fun and show off! So we made a few displays to show off our racks, and they ended up displaying lights, handle bars, wheels and whatnot! The racks are fully functional and can be pulled off and sold to someone on a tight time line, same as the forks, wheels, bars and stems. I built this rack for my friend to go with her full custom StarMichael Bowman frame, back before we started Norther. I wanted to do something fun and different, yet remain classic and timeless, and I think I did! This rack was made of 3/8th aircraft tubing with mounts for Panniers, and an Edelux headlight and wire. This has been her daily ride for years! 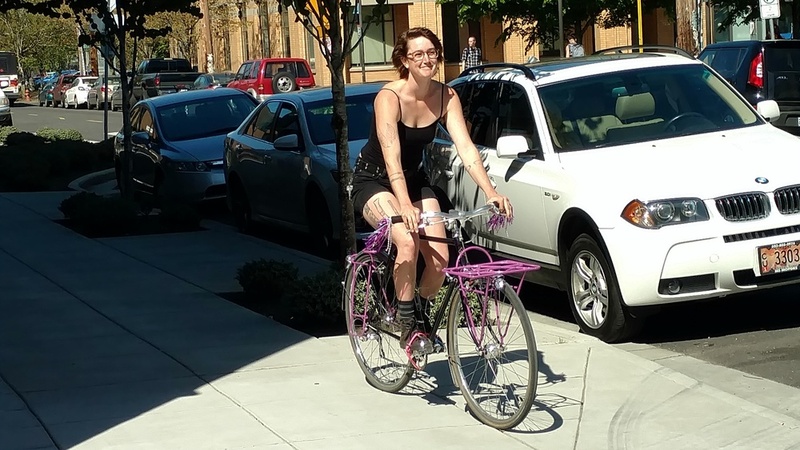 She decided she wanted a fun matching rear rack. She uses a trunk bag a lot so we make her a cool rear rack with a heart shaped platform and low riders for Panniers. 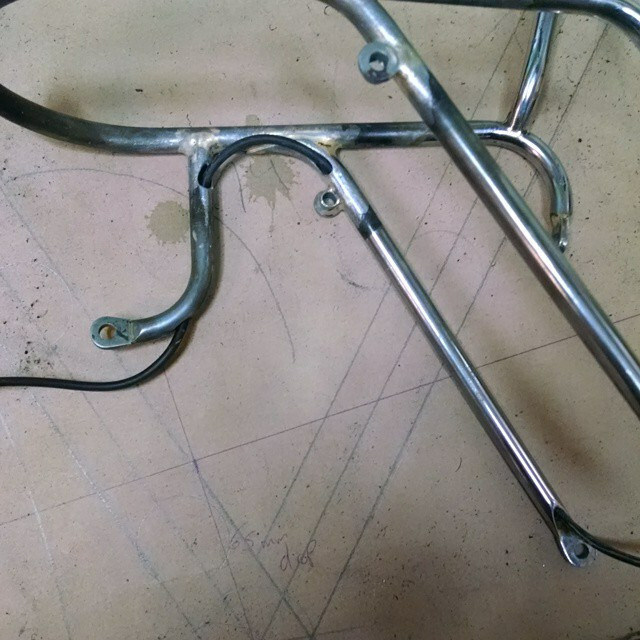 Since we had to powder coat the rear rack, we went ahead and made the front match the new rear. Gino had a cool Box Dog 650b Rando bike, but had a stock Nitto rack that didn't make him happy. 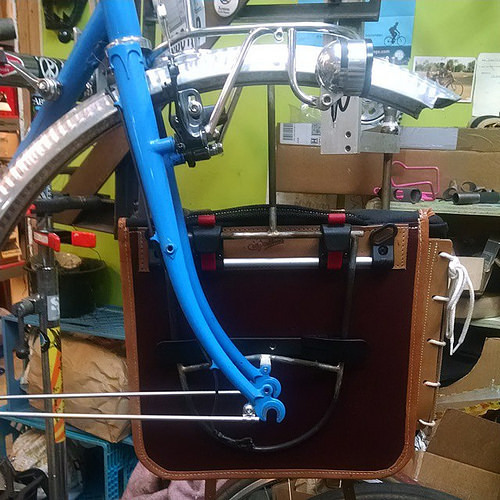 So we came up with a pretty handle-bar bag rack and detachable lowriders for Panniers. This rack is made of 5/16th aircraft tubing for a sleek but super functional life span. 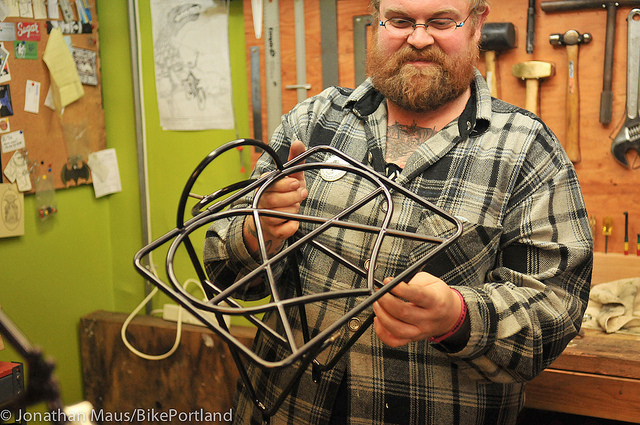 The rack has a light mount for an Edelux headlight, and eyelets for attaching the lowriders. Gino already had a hole in his fender so I had to make the rack to fit, it was a little tricky with this bent tear drop design. Here's another custom rack and decaleur. This decaleur is also mounted on a headset spacer. A cool feature of this rack is the flowing stay that runs from the mounting point on the canti boss all the way up and transitions into a mount for the hanging edelux light. The lights wire runs inside the stay. We made this for a custom frame that was made by a builder that doesn't do racks. 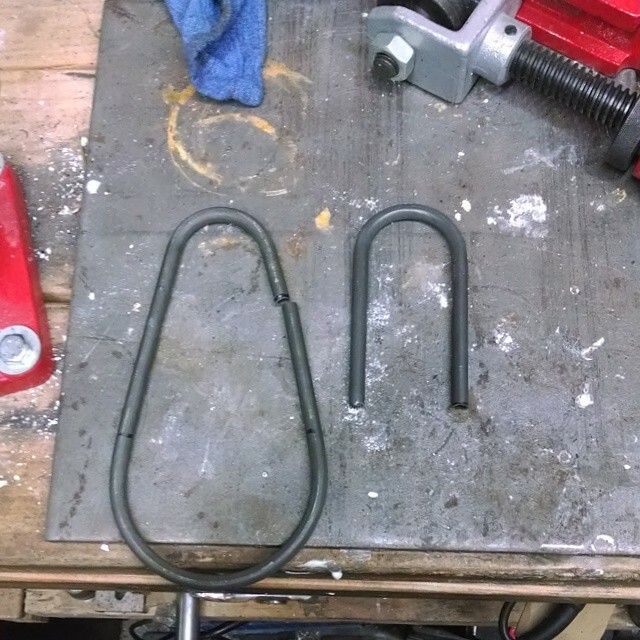 This is pretty common as racks are hard to make and time consuming. 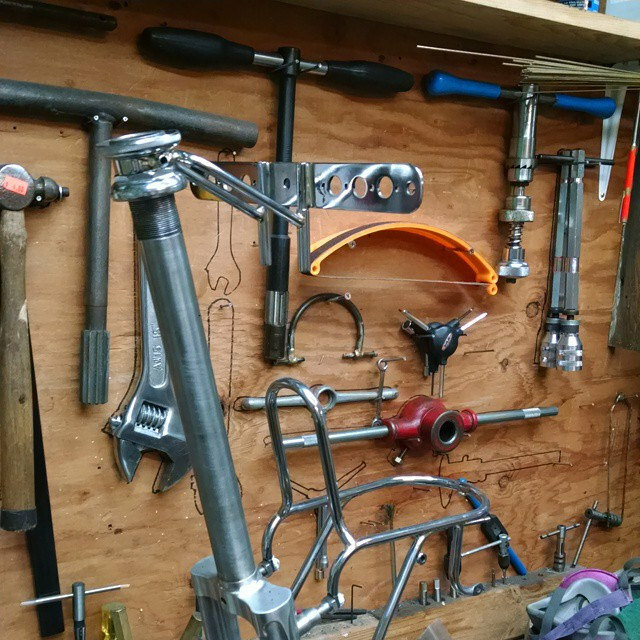 A fast builder can build a whole bike in the same time it takes them to make a rack or two. People usually won't pay for the time it takes to make racks. I still like making them, so custom racks are still a thing. I can see how someday they might not be a thing as Nitto is making more and more acceptable racks such as the ones Compass has them make. 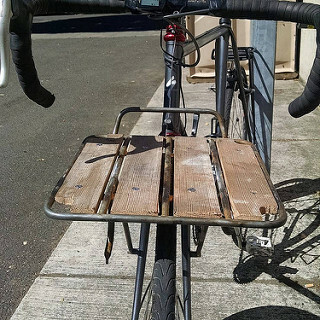 Porteur Rack With Wood Inlays. I whipped up this little rack to do a few things. First off we wanted it stiff so it has four mounting points instead of a flimsy three like most mass production racks. 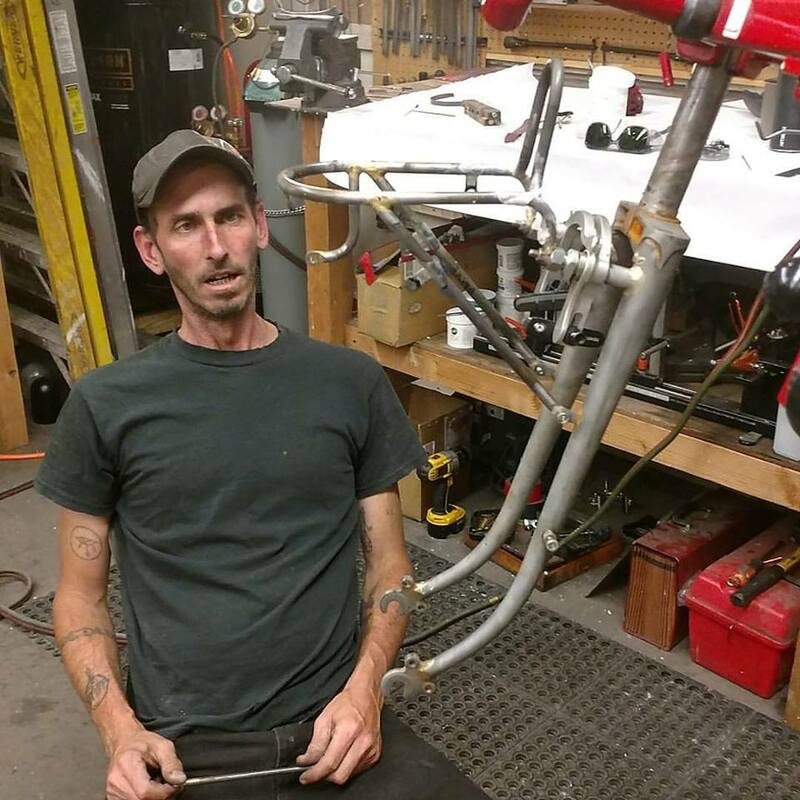 We also didn't want it to stiffen up the fork and wreck the ride so the rack is mounted to the brake bosses and the preexisting low rider mounts. We tried to keep the design simple and elegant. It's made of 3/8th aircraft tubing and some aircraft flat strap. The strap is used to on the bottom of the rack and drilled and taped for M 5 hardware to secure and support the wood platform. I just grabbed some old wood from Salvage Works to make some test panels. The customer was planning on making them from scratch, but ended up liking what I made enough to just sand it town and stain it! 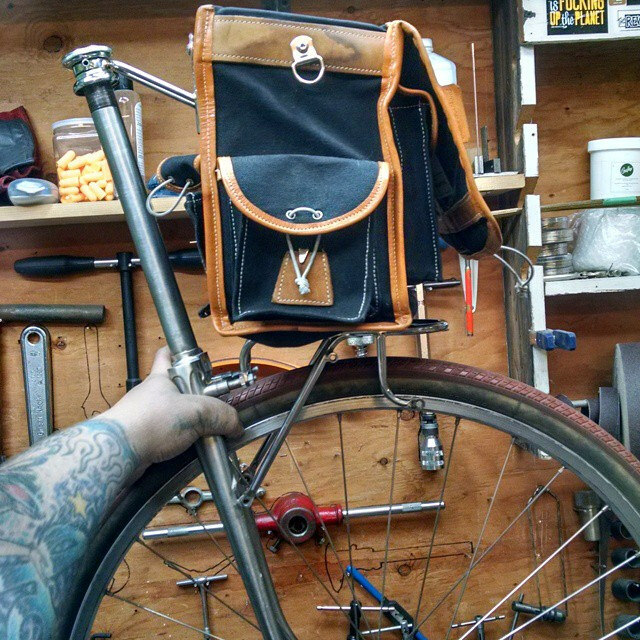 Handle bar bag rack, stuff sack detachable low-riders, and a decaleur for a thread-less stem. This rack is made from 5/16th aircraft tubing and features a light mount and wire guides for a generator hub. 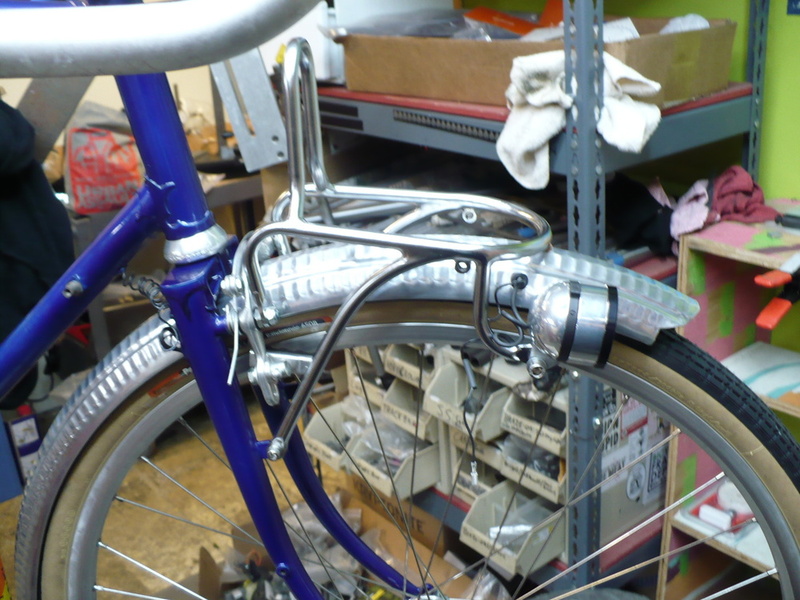 It also has stubby spacing for Paul brakes and their specific double sided rack studs. All In all it came out pretty sweet. The customer had the whole set up powder-coated flat black. Not good for photos. This rack I made myself for my old bike years ago. It's made out of 3/8th aircraft tubing. Yes, that's a little out of place on a rando bike and most people make them out of 5/16th or even as small as 1/4 tubing. 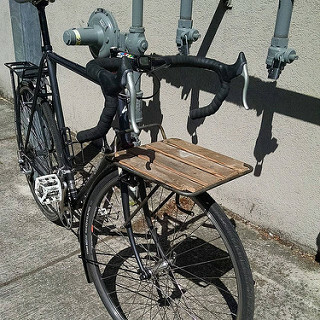 I'm a heavy guy and use and abuse my bike and rack so I went heavy duty, and I'm glad I did as I often overloaded it moving heavy stuff, like bench vices and industrial tools. 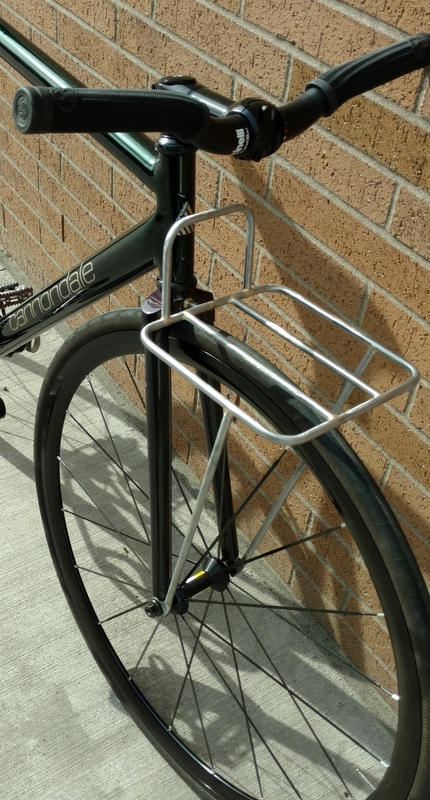 I had the rack "straight plated" at a chrome shop, so it's not high polish. I polish everything now! It's also made for detachable low rider mounts and an Edelux head light. Jhon's 1971 Le Jeune. 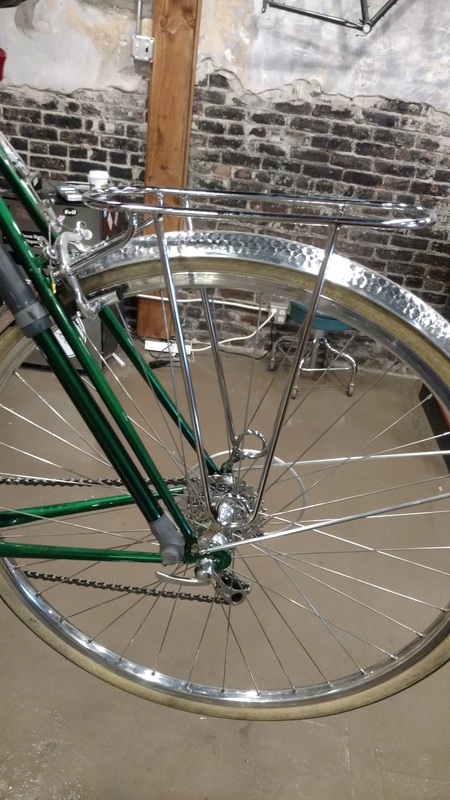 I did a lot of work on this bike, and it's in the frame modification section talking about it. But, this is the rack section! So lets talk about racks. 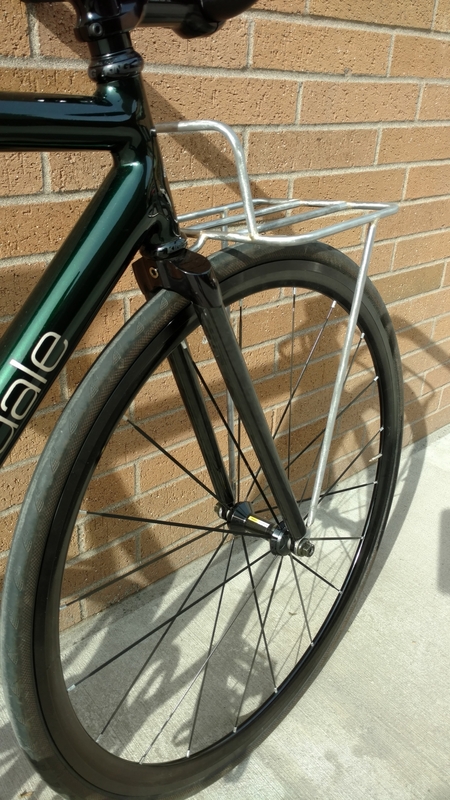 I built a stem bolt mounted decaleur and four custom racks for this bike: A pretty cool simple rear rack with the exception of the mounting point being on the hard mount studs for the Mafac brakes. 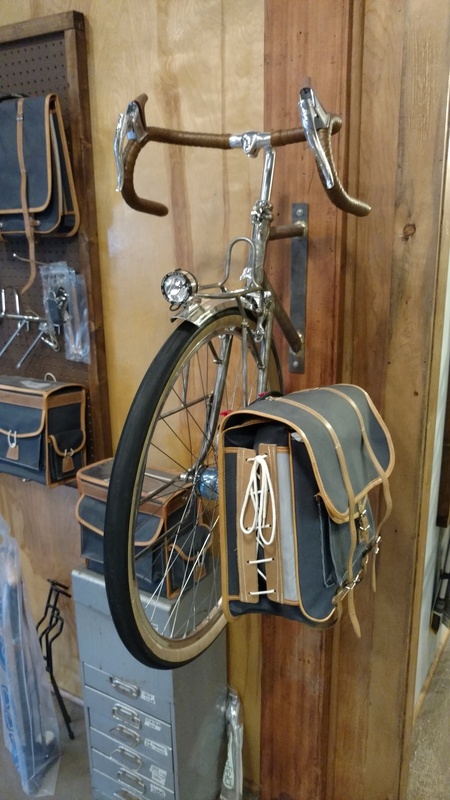 A front handlebar bag rack, and a matching pair of detachable lowrider racks (not pictured). The detachable lowridders are pretty cool. Three simple out of the way bolts that won't rub on the panniers, and allow the rack to be popped off quickly when the front panniers aren't needed. 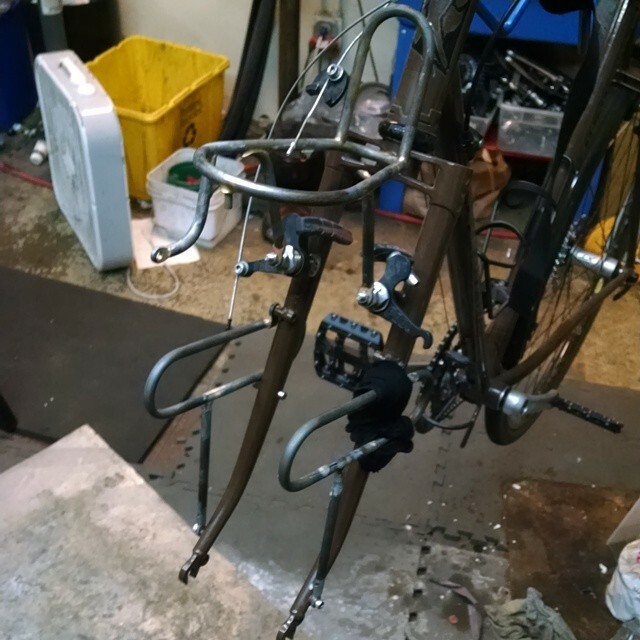 The reason for this is that large racks that bolt to the drop outs stiffen up the fork and make bikes ride crappy. But, this allows him to always leave the handlebar bag rack on the bike for small loads and daily needs. 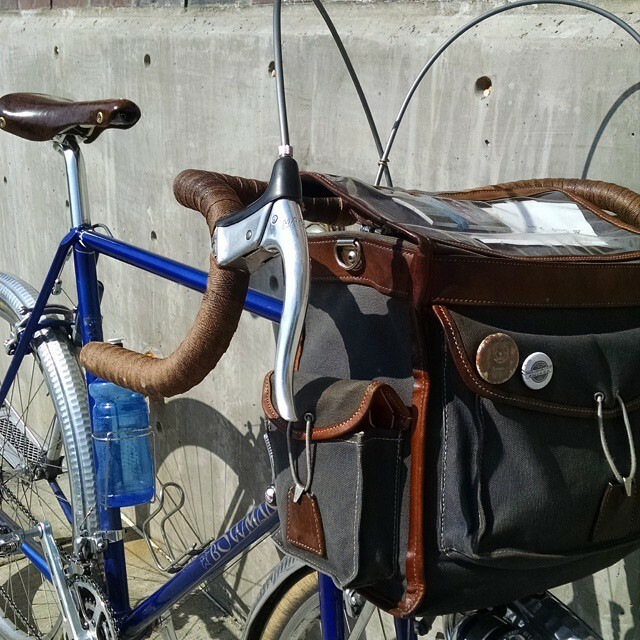 Handle bar bags are the truth! 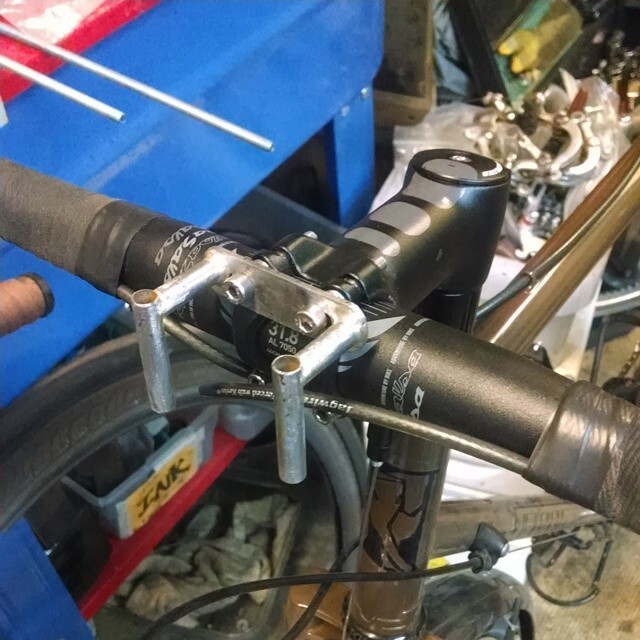 The handlebar bag rack has a built in light mount, and is designed to mount to the front brake studs using special double sided bolts. Yes we sell the double sided bolts in our Shop Section and in store. 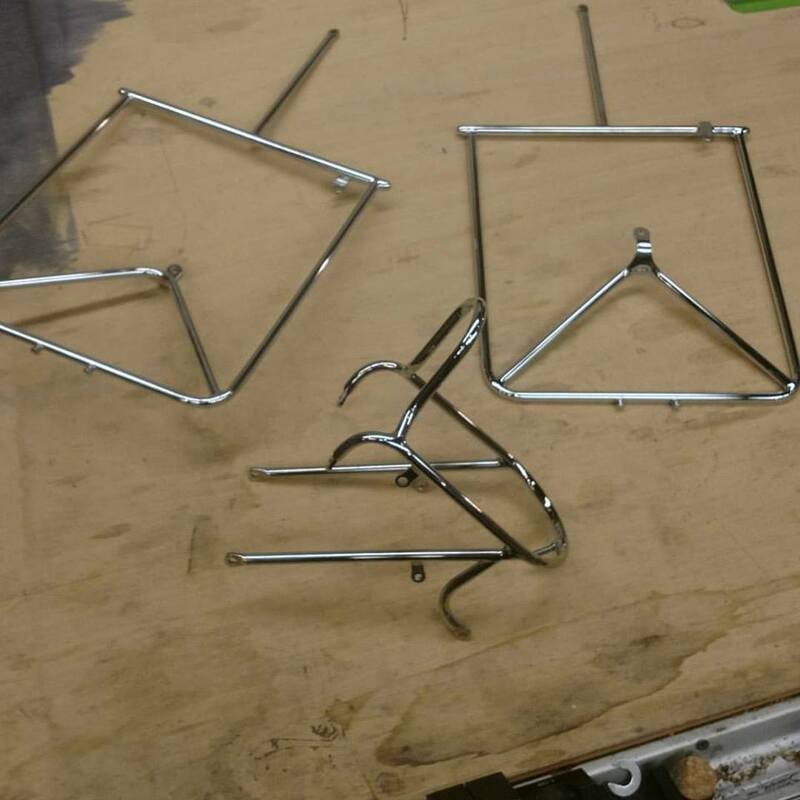 Check out this gallery of some other forks, racks, and decaleurs we made!